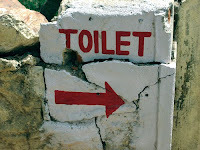 Word'sWorth: NO TOILET! NO BRIDE! This is a good decision...It has to implement in rural areas which are in andhra pradesh. hahaha.. this is interesting.. what all men have to do to get married.. its a great initiative by the govt in getting hygiene taken seriously.. Brilliant, I love this article it's concisely written and draws attention to a very serious issue with humour!